Cat thyroid problems are more common than you may think! There are two forms, feline hyperthyroid and feline hypothyroid, but many of us (including me until a few years ago) may have never heard of these cat illnesses before. My dear Little Mo had this common cat health problem and following treatment she survived for many years and continued to lead a very happy life. I am contacted quite often by owners whose kitty has been diagnosed with one of these conditions, especially hyperthyroidism in cats which is the more common out of the two. Luckily it can be treated with either medication or with an operation and in most cases the cats do recover well. 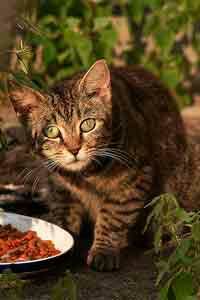 What Is A Cat Thyroid Problem? Cats have two thyroid glands in the neck that produces the thyroid hormone. Its job is to regulate the body's metabolism which means how the body uses and manages its energy. Feline Hyperthyroidism - This is when the thyroid gland becomes overactive and produces too much of the hormone that regulates the body. When this happens the body's metabolism speeds up and works too fast. This causes other organs in the body to over work as well, which in turn can lead onto other cat health problems. For instance, High blood pressure (known as Hypertension) can also be diagnosed along with thyroid problems and this is turn can cause problems with other organs such as increasing the heart rate which in the long term can put a strain on the heart itself, cause damage to the Kidneys, eyes and even brain. Hypothyroidism - This is when the thyroid gland under performs, produces too little thyroid and as a result the body's metabolism slows down. It is often associated with unexplained weight gain and lethargy in older felines. It is less common in cats than the previous condition and is sometimes seen in cats that are being treated for hyperthyroidism, when their medication or other treatment has worked too well. Weight loss. This can be quite dramatic if not treated quickly, and can lead to muscle loss as well as fat loss. Increase in appetite and thirst. Your cat may cry for food all the time and never seem satisfied. In a very small number of cases the opposite may be true, with the cat becoming generally weak and off of their food. Vomiting and diarrhea - These may be spasmodic and may not occur in all cats. Passing urine frequently - You may notice your cat urinating more often. 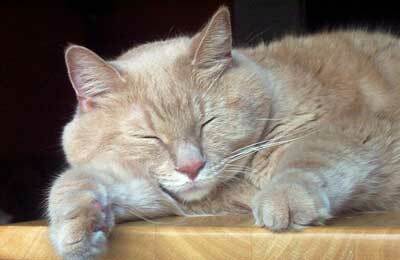 Hyperthyroidism is usually only seen in older cats but cannot be ruled out in younger animals. These are some of the typical symptoms of hyperthyroidism in cats, but they could also be signs of other cat illnesses (for example, increased appetite, thirst, urination and weight loss could indicate diabetes), so do get your kitty checked out properly by your vet! There may be other symptoms and a cat may not show all of the signs above. The only way to make an accurate diagnosis is to take your cat to the vets. Your vet will try to feel with their hands to see if the cat thyroid gland in the neck is enlarged or not. This is not always easy to do as the glands are in a difficult position on the cats neck. If your vet suspects that there is a problem they will recommend a blood test to be taken. 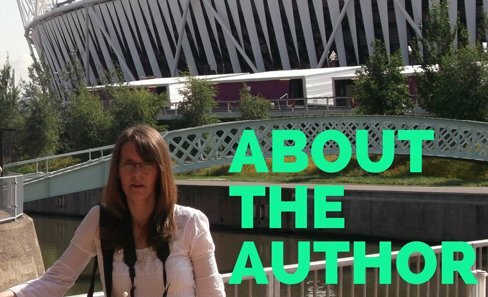 The result of which will indicate whether or not the thyroid hormone is abnormal. 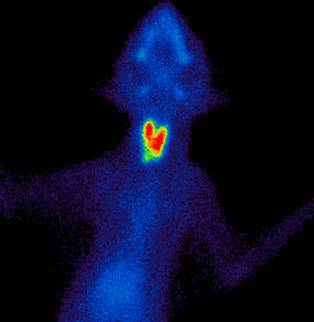 Some specialist vets will be able to carry out a technetium scan of the cats neck. This is a simple procedure which allows the vet to see any changes in the cats thyroid glands. In both conditions the treatment is based upon the blood test results, physical examination and your vet taking into account any other existing cat health problems. There four ways your vet can treat the conditions. Usually the vet will prescribe medication first that has to be given to your pet every day. This medication cannot cure the condition but it does help to return the levels of the thyroid hormone to normal. Your vet will have to monitor your cats condition and the dose of the medication may have to be adjusted to suit your individual cats needs. There can be some side effects which should subside after a few weeks. these include: a reduced appetite, lethargy and vomiting. 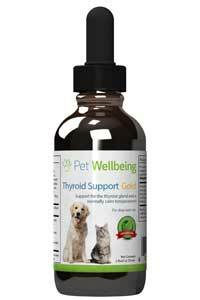 There are veterinary formulated herbal supplements such as Thyroid Support Gold which are designed to help treat hyperthyroidism in cats and alleviate some of the symptoms. It is very important that you get your pet properly diagnosed first by your vet and that you discuss any treatment options with them. This is important because herbal treatments such as thyroid Support gold can interact with conventional cat thyroid medications such as Tapazole. This will still depend upon getting an accurate diagnosis first and consulting with your vet. This is because similar symptoms can result from different cat illnesses, but also because herbal supplements can interact with conventional medicine. Whatever the treatment decided upon, your cat will need monitoring again with blood tests to check the condition and make sure treatment is effective. In some cases medication is not enough to control cat thyroid illness and surgery to remove the affected tissue is recommend. Depending on your cat's condition, the vet may recommend that they remain on medication even after the surgery. The main risk from this surgery apart from the usual anesthetic risks, is damaging the near by Parathyroid glands which control calcium levels. because of this most vets will require the cat to be hospitalized and monitored for a few days after surgery. In some cases previously unaffected thyroid tissue can later become affected which would require further surgery. This treatment is only available at some vets as special handling of the radioactive substance is required. The cat will also remain radioactive for a few days after treatment and so will have to be hospitalized and quarantined. This treatment is 95% effective in the cure of the condition as it destroys only the affected tissue. It is administered by a single injection. IS there a best food for hyperthyroidism? Not a cure but an increasingly effective way of managing feline hyperthyroidism is by feeding ban exclusive specialist diet which helps to regulate iodine in the cats system by not introducing too much via the diet. One such specialist cat food is y/dFeline Thyroid Health food by Hills. This can be purchased from your vet (or similar) or online. Little Mo had an operation to remove one of her thyroid glands. She did put some weight back on afterwards and returned to her old self, being far less jumpy, less hungry all the time and much happier again. So if you suspect that your kitty may have a cat thyroid problem, please do take them to the vets so you can get a proper diagnosis. Treatment can often be very affective with any unpleasant symptoms being greatly reduced. I hope you have found this cat health information page useful, and I wish you and your kitty the very best of health and happiness!